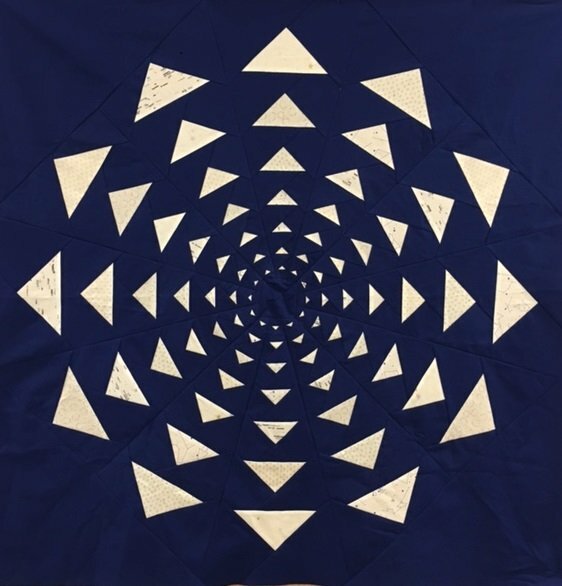 *Blue Bar Quilts will provide one section of the pattern (there are 12 in all) printed out on Carol Doak’s foundation paper for you to use in class. This will give you a chance to try the product out, as well as save you from having to make the copies yourself. You must own your own copy of the book in order for us to give you this printout. **Please pre-cut fabric per the instructions for the pattern “Little Itty Bitties” on page 74 of the book. We will be making one of unit A (to finish the quilt you will need four each of units A, B, and C). This is one wedge of the sample quilt. Therefore, technically you only need one of each of the pieces mentioned in the cutting instructions. If you only want to cut out what’s needed for class, you’ll need one each of pieces 1 – 20, plus A21 and A22. However, my strong suggestion is that you cut out all of the pieces for the whole quilt. Please note that this will take several hours and goes much faster with the help of a friend (to read what you need to cut). Label each piece of fabric; don’t rely on a post-it note to be sticky enough. If you have Wonder Clips, they do a great job of holding the pieces together, along with a paper label for each bundle.